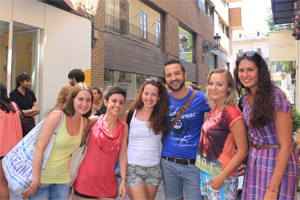 Learn Spanish in Valencia and discover a fantastic city that is still largely untouched by tourism! Valencia is the third largest city in Spain and has a wealth of cultural heritage, combining an atmospheric and beautiful old town, full of small bars and cafeterias, with the futuristic buildings of the City of Arts and Sciences. There are also wide sandy beaches, first-rate sporting and recreational facilities, and above all a marvelous Mediterranean climate - in many ways a perfect location in which to attend a Spanish course in Spain! In addition to language lessons, the school offer a wide range of optional activities, with visits and excursions in the afternoons, evenings and at the weekends which give students plenty of opportunity to explore the city. Our school is located in the very heart of the city and uses two buildings. The first building has 12 classrooms, located around an attractive patio with a pond. 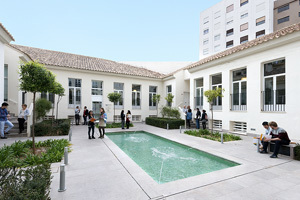 In addition to the classrooms, there is a kitchen where Spanish cookery lessons are held, a computer lab and student reading area where students can study after lessons. The second building has 10 classrooms and occupies a traditional four storey building with a roof terrace. Each of the 22 classrooms is equipped with an interactive whiteboard and air-conditioning. Fly to Valencia. Airport collection is available. School located in the heart of the city centre.